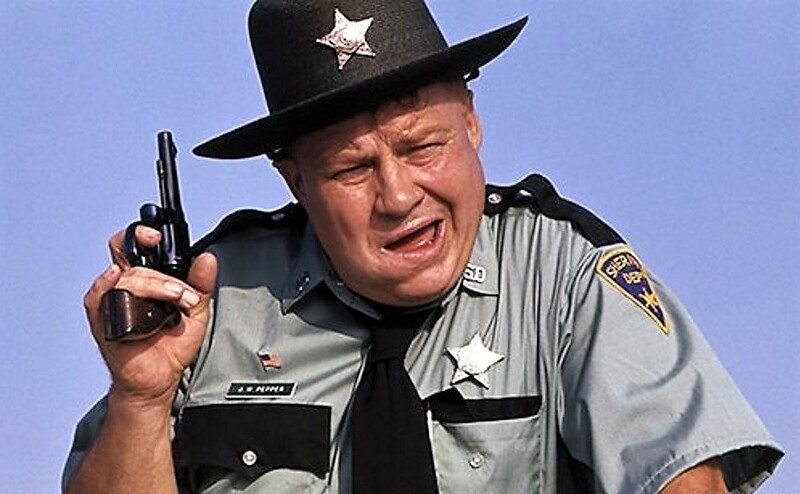 The Associated Press reports that actor Clifton James (seen in the above photo), best known as the Southern sheriff in two James Bond films, has died. He was 96. Although I liked Sean Connery's amusing asides in the early Bond films, I didn't care for Roger Moore's lighthearted approach to portraying Bond or the action-comedy films that evolved from the early Ian Fleming-based James Bond thrillers. But having said that, I laughed at Clifton James’ portrayal of Louisiana sheriff J.W. Pepper, who appeared in Live and Let Die and The Man With the Golden. In Live and Let Die, as Roger Moore was being chased by the bad guys in boats, one of the bad guys parked his car on a road near the water, waiting for Bond’s boat to pass. That’s when Sheriff Pepper pulled up. Pepper, overweight, a bit sloppy and with a mouth full of chewing tobacco, walked towards the bad guy and accused him of speeding. The bad guy, somewhat dismissive of the old sheriff, started to pull out his gun, but Pepper beat him to the draw and had his service revolver out first. Clifton James, a decorated WWII veteran, also portrayed a more serious cop in The New Centurions, the film based on Joseph Wambaugh’s first novel. He was a good character actor. RIP.